Have you jumped on the reusable water bottle bandwagon? With all the news about bisphenol A and other endocrine-altering chemicals leaching from baby bottles and other water bottles, I wonder why everyone isn’t carrying around a safer container for drinking water. 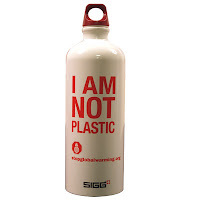 Like the Sigg or Klean Kanteen bottles that are now widely available. Not only are they safer to drink from, they don’t contribute to the giant waste stream we’ve created, like the Great Pacific Garbage Patch — a veritable island of plastics estimated to be anywhere from the size of Texas to more than twice the size of the US. So what kind of water does one fill these nifty reusable bottles with? Good ol’ fashion tap. You can attach a filter to your sink, use a Brita, the office water cooler, or find a public water fountain. And which to get? I have a couple of Siggs (which come in lots of fun designs) but if I were to buy them again, I think I’d go with the pure stainless steel construction of Klean Kanteen. The American Dental Association recommends we use a toothbrush for about 3 to 4 months and then replace it. Instead of amassing a collection of used toothbrushes to reuse for cleaning the crevices around the toilet, or worse, just tossing them in the trash, there’s Preserve by Recycline. The toothbrush — designed with the help of dentists — is made mostly from recycled Stonyfield yogurt cups (#5 plastic, which comes from various partner organizations, one of which is right here in Brooklyn). And when it’s time for a new brush, you can send them back to Recycline in a postage-paid envelope they provide. They’ll integrate them into plastic lumber for park benches and decks. You can buy them in bulk or sign up for a toothbrush subscription on their site to ensure you get a new toothbrush every 3 months. 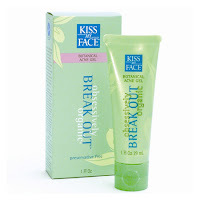 on the quest to find a daily beauty regimen without all of the nasty crap in it, i came across the kiss my face obsessively organic product line. they have a whole mess of products to cover all of your cleansing, moisturizing, toning, anti-aging, and spf’ing needs. overall, i think they’re great. they work well with my sensitive skin, they’re paraben-free, they’re not tested on animals, and like the name suggests, they’re made with organic ingredients. the one problem i have with them is that the only part of the packaging that’s recyclable is the box, not the tubes. where can i get me some of these? and for you brick-and-mortar types who live in nyc, ricky’s has ’em, too. welcome to the first edition of supereco. everyone who hasn’t been living in a bunker underground for the last few years has heard about “green,” “eco-friendly,” “sustainable,” or “LOHAS*” and nowadays there’s a wealth of info out there on the subject. i hope to support all of these great resources out there which help us reduce our negative impact on the planet and our health. i’ll be posting things like product reviews, tips, and the latest news on all things eco-friendly. supereco: listen to your conscience, it’s telling you to preserve your health, serve the planet, and conserve our natural resources. *LOHAS=lifestyles of health and sustainability. check it out here. You are currently browsing the Raganella blog archives for May, 2008.